US Intel Knew Of Saudi Plan To Abduct Missing Journalist; Turkey Releases Footage Of "Hit Team"
U.S. intelligence services intercepted communications of Saudi officials discussing a plan to capture Saudi journalist and government critic Jamal Khashoggi, whose disappearance in Turkey last week threatens to damage the warm ties between the kingdom and Washington. The Saudis were discussing a plan to lure Khashoggi back to the kingdom, The Washington Post reported, citing a person familiar with the communications, which were intercepted before he vanished. Khashoggi, a columnist for the newspaper, was last seen entering the Saudi consulate in Istanbul on Oct. 2 and is feared to be detained or dead. For whatever reason, the Post report buried the lede as the story is headlined simply, Saudis are said to have lain in wait for Jamal Khashoggi. But the story confirms US intelligence had clear evidence that the Saudi journalist and Washington Post columnist was about to be kidnapped and possibly worse. The WaPo story includes the following: "Before Khashoggi's disappearance, U.S. intelligence intercepted communications of Saudi officials discussing a plan to capture him...". Authorities are not hunting for this black van seen in newly released CCTV footage airing on Turkish state television. And it now appears the long awaited evidence in the possession of Turkish authorities showing the Saudis to be behind journalist Jamal Khashoggi's disappearance and alleged murder has been released. 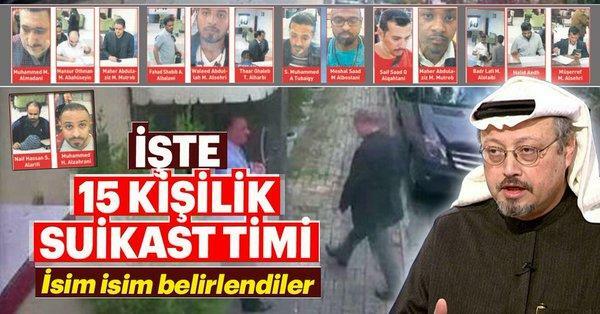 Turkish media is now buzzing with multiple new developments which continue to piece together the allegations of Turkish investigators — that a 15-member team entered the country from Saudi Arabia for his "preplanned murder" as Khashoggi was visiting the Saudi consulate in Istanbul last week. First, the Turkish newspaper Sabah has released what are purported to be names and photographs of the 15 Saudis who are suspected to be involved in the disappearance of the Saudi journalist. Subsequent to Sabah's publication of the names and photos, researchers were able to identify most of their occupations and recent locations. The alleged group that entered the country on the day of Khashoggi's disappearance included a Saudi special forces soldier, a lieutenant colonel in the Saudi Civil Defense, a forensic specialist, an air force officer, and at least one recent member of Saudi embassy staff stationed in the UK. And further significant is that Turkish state media has published video footage and still frames of Saudi planes and agents landing just prior to the alleged crime, with several suspects passing through passport control — now being sought by authorities. Turkey's public broadcaster TRT World has obtained video footage which shows the Saudi government critic Jamal Khashoggi entering the Saudi consulate on October 2nd. The video also shows alleged Saudi planes and agents, whom Turkish officials want to investigate in relation to the dissident journalist's disappearance. Turkish police are reported to be searching for the black van shown in the CCTV camera footage exiting the consulate grounds after Khashoggi disappeared inside. TRT World reports: "Turkish officials want to know what's in that van and where it is now." Sources close to the investigation believe the Saudi journalist and Washington Post columnist was "brutally tortured, killed and cut into pieces" and his body removed from the consulate. The initial plane left Istanbul at 10:45 p.m. and made a stop about 280 miles to the east in Nallihan, Turkey. Then it skirted the border between Iraq and Iran, favoring the Iraqi side, and crossed over the Persian Gulf. It landed in Dubai at 2:30 a.m. The following morning, Oct. 3, it took off for Riyadh. The Turkish authorities alerted to the disappearance of the journalist Jamal Khashoggi rushed to Istanbul airport to search a private jet but were too late to prevent it taking off for Riyadh. It had spent barely an hour on the ground before flying out again. Another Saudi plane that had landed earlier that day, believed to be carrying members of a hit squad, was still on the tarmac and the authorities were able to board that craft — but found nothing of note, according to Turkish media. With this amount of evidence piling on, Saudi officials — who have consistently denied any involvement in the journalist's disappearance — will find it harder to stonewall further. On Monday President Trump had for the first time addressed the Khashoggi disappearance, saying: "I am concerned about that. I don't like hearing about it and hopefully that will sort itself out." Adding to Trump's softball it "will sort itself out" statement, the State Department addressed the Khashoggi issue with only few more words as it essentially called on Saudi Arabia — the presumed murders — to investigate themselves, as WikiLeaks aptly noted. The statements reads: "We call on the government of Saudi Arabia to support a thorough investiagtion of Mr. Khashoggi's disappearance and to be transparent about the results of that investigation." However, with Tuesday's developments Trump will also feel the pressure to actually address the issue beyond mere "hopeful" words that it "will sort itself out".